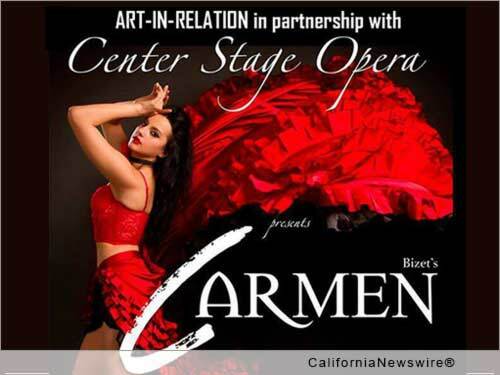 LONG BEACH, Calif. /California Newswire/ — Art-in-Relation (AIR) will present a co-production of the classic opera "Carmen" to The Ernest Borgnine Theatre, Saturday, June 20, 2015. The co-production will run for one performance only. The Ernest Borgnine Theatre is located at 855 Elm Ave. in Long Beach. Danielle Marcelle Bond (LA Opera, Long Beach Opera, Opera Classica Europa) stars as Carmen, a carefree and manipulative woman who woos the corporal Don Jose, played by Grammy-nominated tenor Rodell Rosel, a veteran of The Metropolitan Opera, LA Opera, and Lyric Opera of Chicago. Their relationship leads to his rejection of his former love, mutiny against his superior, and the ultimate, tragic climax of the story. A joint production of Center Stage Opera and Art In Relation, "Carmen" is directed by Dylan F. Thomas, and features the Center Stage Opera Orchestra, conducted by Brian Onderdonk. The opera will be performed in the original French, with English translation projected above the stage. In conjunction with the production, the companies will be collecting non-perishable food items for the Long Beach Food Finders. Housed inside the 1920's Scottish Rite Event Center, the Ernest Borgnine Theatre is a natural match for the acoustics of opera. From the stirring Overture to the Toreador Song and Habanera, the music of "Carmen" is among the most widely recognized and beloved in all of opera. Bizet's captivating portrait of the seductive gypsy woman, Carmen, is conveyed through a score that is stunning, magnetic, and unforgettable. Now concluding its 10th season, Center Stage Opera not only presents first-quality operatic and Broadway productions, but also has extensive community service and educational programs throughout the Los Angeles area. Co-producer Art-In-Relation, a performing arts company founded by Jonas Sills and Ray Buffer, is entering its 2nd season of productions at the Ernest Borgnine Theatre, and will present "Joseph and The Amazing Technicolor Dreamcoat" in August, and "Chess The Musical" in October, 2015. AIR is proud to help bring traditional opera back to Long Beach with this production of "Carmen." Learn more about AIR at: https://www.facebook.com/artinrelation/ . Tickets for "Carmen" are $40 for Orchestra seats, $35 for Loge seats, with discounts for seniors, students, and groups. Tickets may be purchased online at http://www.centerstageopera.org/ or by phone at 818-517-4102.